Most BTR hosts depend on the actual chat room head count to determine if they have a popular show or not. EDC Creations does not. Our audience is not soley in the BTR chat room. They live around the globe and come from all walks of life. We have millionaires listening in Las Vegas and little housewives in Dublin! We know because they reply to us from the email newsletter with much praise about the people we bring to empower them. They also go to iTunes, Podbean, 130 of our social network profiles and the BAN Radio Show homepage to download the shows weekly. Our fans receive our show in their email accounts so they do not have to stop their lives to come in the chat room. They love us for making life easier! EDC Creations goes beyond the chat room to let people know about you and your product. A chat room can only hold a few folks, but our RSS feeds can entertain and educate all 165, 000 of our subscribers weekly! Readers Love Us! Join us and you soon will too! Q: What is BAN Radio and what are some of its roles in the publishing industry? The Black Authors Network (BAN) is dedicated to providing information to help black business owners and authors gain access to today's consumers and to helping promote the growth of black businesses and literature. The Black Authors Network, is here to bring people together, to create a dialog, and share valuable resources. Our goal is to serve the unique needs of authors, businesses, organizations, and concerned parents who wish to improve literacy and strengthen the new literary community. We represent publishing houses, independently published authors, event planners, publicity representatives and most of all the readers of quality literature in our pursuit of excellence! The concept for the BAN Network came after an interview will literary legend, Pat G'Orge Walker. She explained the necessity of the Black literary community pulling together and supporting each other and our genres. We decided at that time we would encourage, inspire, and empower our members, as they strive to fulfill their dreams of becoming successful entrepreneurs, published authors, and community leaders. To accomplish our goals we create virtual events and promotions, local networking opportunities, provide professional web development and form strategic alliances with book lovers, authors, social network partners, and business owners around the world. On BAN Radio we promote quality literature period. We welcome books from all genres and authors of any race, nationality, culture or stage in publishing. Join us as we capitalize on these brilliant opportunities and successfully address the challenges we face as a progressive, pro-active people. If you would like to be a guest on the BAN radio show, you will be joining a family of people dedicated to the advancement of literature and the improvement of literacy within our communities. Reserve your slot here today. Email the BAN Radio Show Producer, Ella Curry, here. Q: Other BTR shows do not charge fees. Why do you charge for interviews? We absolutely do not charge for the interviews on Blog Talk Radio. EDC Creations charges for the use of their services to promote the book before, during and after the showcase. The fees go toward the maintenance and staff that operates behind the BAN Radio Show to support the authors. The Black Authors Network Radio show goes beyond the BTR platform to showcase your interviews, commercials and panel discussions. We have syndicated our radio show in various networks around the Internet. We offer our 165,000 readers the opportunity to meet our guests and to take action afterwards. Your experience on a BAN Radio Show is an event, not just an interview! Q: After paying the $45.00 fee to the EDC Creations staff, will they work on promoting my book? Will my book be placed in your network and on-line stores? We will place your book on our BAN Radio newsletter, on the BAN Radio blog and will add it to our Amazon sponsored bookstore. If the book is not listed with Amazon or shows "out of stock" details, we can not add it to our stores. We will link the book to the author's website or book sellers. We will promote the small business owner on BAN Radio Show as well. We also host community events for other organizations working to better our neighborhoods. Q: Do I choose the date and time before or after I pay the $45.00 fee? After submitting the administration fee, we will look at our calendar and schedule your showcase. We keep our shows booked weeks in advance. If you have a book release date or a blog tour planned, it is wise to contact us the month prior to the release. If you have a particular date in mind for your event, you can pay $75.00 to select your own date and time slot, if the host doesn't have a prior engagement scheduled, your hour long event can take place. All regular BAN radio shows take place on Monday or Wednesday at 8-10pm EST. Other days can be obtained by contacting the BAN Radio producer and host, Ella Curry at: elladcurry@edc-creations.com. All fees go to EDC Creations Media Group for the promotion of the book or product by their company, not for the actual interview on air. The interviews on BTR is always FREE. Q: Who is the host of the BAN Radio Show? How does the host fit into the publishing industry? Ella D. Curry is the president of EDC Creations Media Group. She brings more than twenty-three years of PR and marketing experience to clients in film, music, publishing and corporate event planning. Her expertise, as well as her love for all things literary has earned her a reputation as a respected leader in the publishing/marketing industry. Ella has enjoyed an extensive tenure in media promotions and book publicity. She started out as a corporate event planner and website developer; later becoming a buyer for the legendary Karibu Book Store chain. Her career now includes services such as blog tour coordinator, book coach, video journalist and literary publicist. While providing media coverage for the Congressional Black Caucus Author's Pavilion and Book Expo America for the last 5 years, Ella has found that interviewing profound community leaders, shaped her own life and business. She has interviewed and learned from: Dr. Julianne Malveaux, political commentator and 15th president of Bennett College, award-winning journalist Gwen Ifill, Dr. Brenda Greene, Exec. Dir. of the Center for Black Literature, Medgar Evers College, Annette Gordon-Reed, and American historian and Harvard Law School professor, and Lynn Richardson, the The Mortgage Guru and leader of MC Lyte's Hip Hop Sisters Foundation. Ms. Curry lives in Maryland with daughter. When she's not working, she loves to travel, write short stories, and chatting in Internet groups with her international group of friends. As her entrepreneurial spirit guides the way upward, she continues to involve herself in challenging, life enhancing projects. Q: Will it air live including a link that I can send to my subscribers? All BAN shows air live on the Internet. There will be a chat room for your guests to meet with you during the live interview. The link is provided in your confirmation email. Please print and save the show information. Pass this information on to your guests and network. After the show, it is available for download to iPods, your computer, CDs and most importantly by a widget you can place all over the web. The BAN Radio Show is syndicated to 130 live Internet feeds and blog directories. The show creates email 2 newsletters which are later sent to our subscribers via RSS feed and email. Your appearance will remain in the BTR BAN Radio archives for you to use as needed. Q: Is the format one in which your listeners can call in with questions? Yes. We welcome callers to the show. We ask that they call from a very quiet place. We will open the mic and allow them to share reviews, ask questions, and to join in the conversation. We offer gifts for participants in our show chat room and for those who blog with us during our showcases. The gifts are normally books or gift cards. We ask each author to provide us the first six digits of their special guests phone numbers, so that we know who we have on the phones. All other numbers on the switchboard are usually the fans or our listeners. Q: Are the interviews conducted by the host after you review the authors book? Does the book have to be in stores before the interview. Do you allow ebooks too? No, your book does not have to be printed to discuss it. BAN Radio shows are normally conducted by the host Ella Curry. However, from time to time we have guest hosts and co-hosts. Your interview will be based on your comments and active participation in the show. We do have branded interview questions to start the conversation, after that, we go with the flow! Other guests on the show can ask questions and make comments as well during your interview. Know your book! Ella will always ask about the relationships in the book, how your book relates to today's society, how your book impacts the reader and what your book will do for the community. These questions will be asked for fiction and non-fiction titles. We accept ebooks too. Ella prefers that she read the book, then conduct the interviews. She will have a better idea where to lead the questions. However, the authors can provide enough details in their responses to conduct a fabulous show, even if Ella hasn't read the book. On BAN Radio, we do not just sell books. We give the gift of knowledge! Your goal should be to sell our fans the dream, passion and news surrounding your network! Q: What do you do with your review copies after reading them? We donate all books to book clubs, share books with our chatters as gifts, and give to homeless shelters in the DC/MD area. We do not sell our review copies online or at events. However, they may be placed in baskets, used as contest prizes, or added to grab bags that we/partners raffle off for charitable events. If the book is a 5-star read, Ella will keep the book and add it to her collection. All reviewers keep the actual books for their own home libraries. Your book will be placed in the hands of avid readers! Once we review the books, we rate them on the Black Pearls Magazine and on Amazon Listmanias. Explore Black Pearls Magazine here. Explore Our Listmania Lists here. Q: What is the actual website link to the radio show and the companion blog? For the most stimulating conversation on the planet, join Ella Curry and her guests on the BAN Radio Show. Email Ella to establish a date and time to share your book or business with the BAN fans across the world! 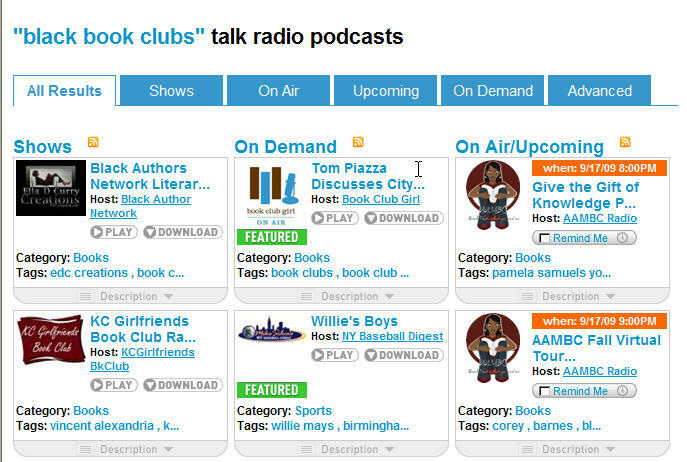 Q: Does the BAN Radio Show support virtual book tours? Yes, Black Pearls Magazine and EDC Creations Media Group hosts monthly virtual media tours for authors! We also provide promotional services for book tours online and offline. We are always seeking people to add to our tour stops as hosts. We are now accepting new stops on the tours. 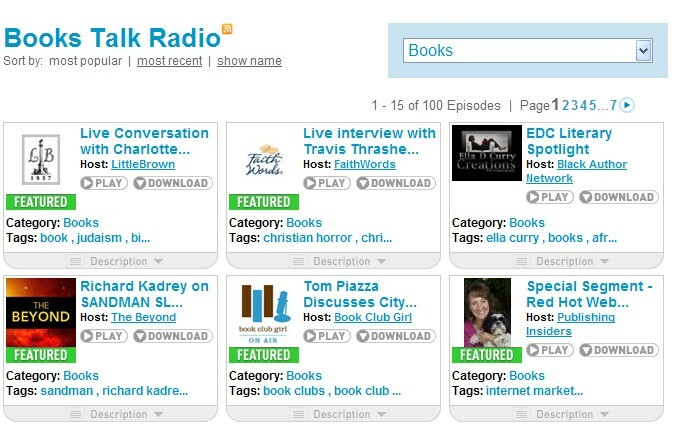 We also hold virtual book release parties on the show for $155.00. The fee is for the promotions behind the event. Would you like authors to visit your radio show, website, blog or to hold a tele-conference with your friends? Join our team today. To become part of the Black Pearls/EDC Creations family, email Ella Curry at: edc_dg@yahoo.com and put "Book Tour Host" in the subject line. Virtual book tours bring traffic to your sites and are a great way to create publicity surrounding your projects too. Become a Tour host today. 165,000+ subscribers, we found out the following information about our readers. These numbers are based on 91% participating in the survey. The readers were surveyed on the Black Authors Network and Black Pearls Magazine potential to educate and entertain them weekly. Read the summarized data below to obtain a snapshot of the purchase power of our readers and subscribers. We use this information to determine our campaign approach. brought to you by EDC Creations!